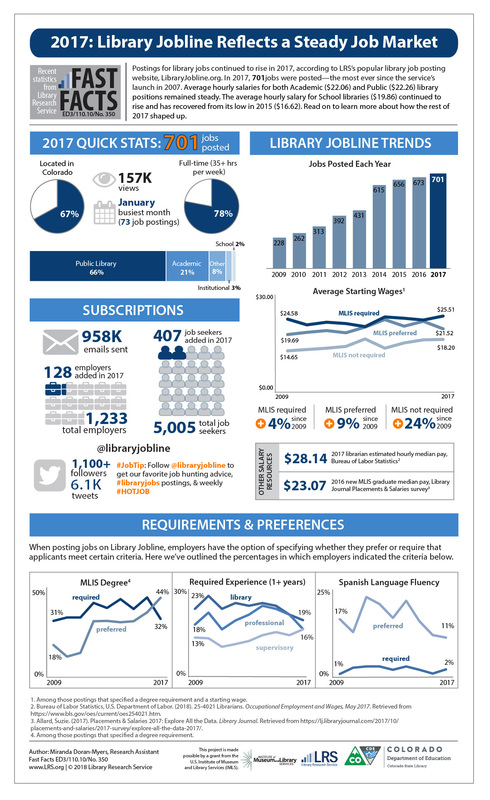 Postings for library jobs continued to rise in 2017, according to LRS’s popular library job posting website, LibraryJobline.org. In 2017, 701jobs were posted—the most ever since the service’s launch in 2007. Average hourly salaries for both Academic ($22.06) and Public ($22.26) library positions remained steady. The average hourly salary for School libraries ($19.86) continued to rise and has recovered from its low in 2015 ($16.62). Read on to learn more about how the rest of 2017 shaped up.